Mr. Hosseini is an okay writer. He is, however, an amazing storyteller. And no, the two are not the same. There is nothing remarkable about his style. But the story is what hooked me. I cried through about the last 80 pages. 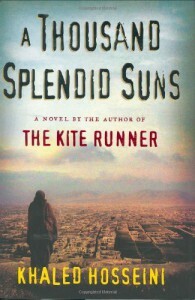 And nearly three weeks after I finished reading A Thousand Splendid Suns, I still tear up when I think about it. I read this book at the request of my 16 year old daughter who read it for her English class last year. I'm so glad schools are incorporating stories like this into their curriculum. I think it will empower American girls by making them realize what a gift freedom is.